Medical studies indicate that only 20% of skin ageing is due to our genes, whilst the balance of 80% is due to controllable factors such as ultraviolet light and pollution. With this in mind, we have created a range of advanced Medi-Facials to strengthen and defend skin against environmental stresses. The combination of advanced procedures and superior cosmeceutical ingredients focus on individual skin conditions and allow us to successfully target a wide range of skin problems. A pick-me-up treatment for dull, tired-looking skin. Deep-cleansing, exfoliation and a customised mask leaves skin looking fresher, brighter and more relaxed. Customised to detox and revive dull, sluggish and congested skin. 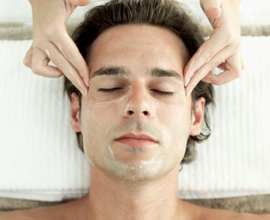 Deep-cleansing combined with exfoliation and lymphatic drainage massage stimulates circulation and eliminates toxins. Calming blue light LED therapy, a bespoke mask and an energising hot towel compress leaves skin looking refreshed, brighter and evenly toned. A refreshing uplifting boost for tired, lethargic and dehydrated skin. Deep-cleansing combined with exfoliation and lymphatic drainage massage boosts the skin's natural metabolism. Rejuvenating red light LED therapy, a bespoke lifting mask and energising hot towel compress stimulates production of healthy new skin cells and collagen fibres, to leave the skin looking firmer, lifted and brighter. Customised to infuse vitamins and anti-oxidants into the skin. This anti-ageing facial uses Ionwave pulsed electrical current to push active vitamins, minerals & anti-oxidants into the mesoderm layer of the skin. This hydrates and stimulates collagen and elastin production, improving the appearance and texture of the skin. Your treatment starts with a customised exfoliation of either a GlõChemical peel or diamond microdermabrasion prior to the infusion, to increase the penetration of your treatment leaving the skin with a refreshed rejuvenated glow. Our acclaimed signature treatment for face and décolleté. Customised to your skin's individual condition and needs, this includes therapies including a GlõChemical peel, lymphatic drainage, diamond microdermabrasion, hydra-dermabrasion, Hydropeel, MesoGlow vitamin infusion and visible spectrum light LED therapies. The treatments is complimented by a relaxing facial and bespoke mask, to leave the skin looking immediately lifted, luminous and rejuvenated.